When news broke that Apple was considering creating a smaller version of the iPad to compete directly with tablets in the 7-inch category, Apple fans rejoiced. Since then, people have been curious as to what the iPad Mini specs would be; people have been asking what kind of processor it would be running, what kind of display it would have and what would its dimensions be? Today, we’ve got some additional iPad Mini specs rumors that’s focusing a bit on the display. Initially, iPad Mini specs reports suggested that it would have a 7-inch screen in order to directly compete with other tablets in that category like the Amazon Kindle Fire, the Google Nexus 7 and Samsung’s Tab series. But if these reports about the display manufacturing are correct and the display would be at 7.85 inches, then it actually brings Apple’s iPad Mini closer to Motorola’s Xyboard which has an 8.2 inch screen. Still, even with just 2 inches shaved off instead of 3, the smaller form factor will still undoubtedly attract new people interested in the iPad but were turned-off by the “bulky” 10-inch frame. 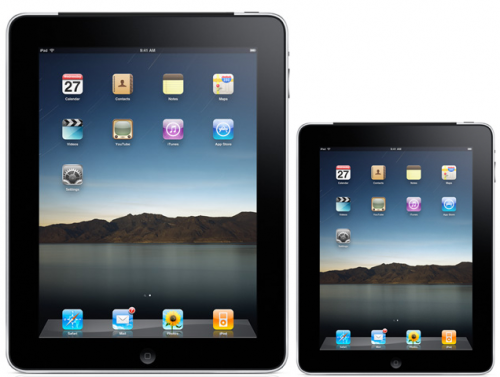 The iPad Mini is expected to be launched in September and retail for less than $499 price tag on the iPad.